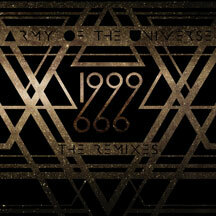 12 inch single features remixes of the title track "1999" including a remix from Alec Empire of Atari Teenage Riot. Army Of The Universe combine electronic rock, electronica, analog synths, & industrial dance beats into a unique and compelling sound. The follow up 12 inch single to the recent 1999 & The Aftershow features remixes of the title track "1999" including a remix from Alec Empire of Atari Teenage Riot.